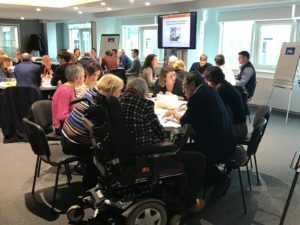 On Friday 1st February, the NIHR Devices for Dignity Med Tech Cooperative (D4D) in partnership with the Yorkshire and Humber AHSN, hosted a collaborative workshop to identify unmet needs for people living with long term neurological conditions and create project teams to develop solutions to address those needs. Attendees at the event, included people living with or caring for people with long term neurological conditions, researchers, health care professionals, designers, and commissioners, who braved the wintery weather to share experiences, knowledge and expertise within the themes of Sleep; Arm Function; Mobility; Monitoring; Environment and Remote Support. Professor Chris McDermott, Long Term Neurological Conditions Theme Lead for Devices for Dignity, said “I’d like to thank everybody who contributed to the workshop by sharing their experiences around unmet needs, and forming new collaborations for the co-production of new technology solutions. The workshop generated new early stage ideas and collaborations for further development however for those who were unable to attend, there are still opportunities to contribute by submitting an unmet need via our website, here. Thanks to Lab 4 Living at Sheffield Hallam University and Westfield Health for supporting this event.